You are looking at three gorgeous jar candles from Diptyque’s Collection 34. Each of La Prouveresse, 34 Boulevard Saint Germain, and Le Redouté come in oval shaped, non-standard jars (where the standard for Diptyque is a round, glass jar). La Prouveresse and Le Redouté are poured into one of a kind, clay jars, made by the “mixed clay” (terre mêlée) method. 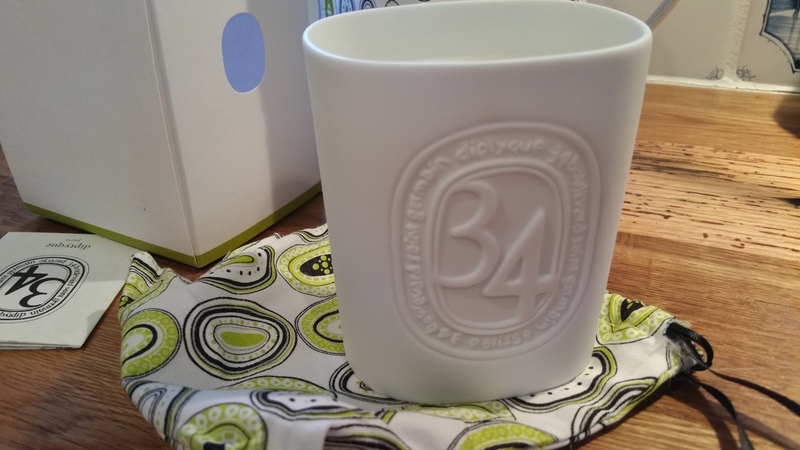 34 Blvd Saint Germain comes in a white, porcelain jar. At 7.3 oz each, these three candle are slightly larger than the standard 6.5 oz candles. In working through all of Diptyque’s candles, I had kind of put these three to the side. 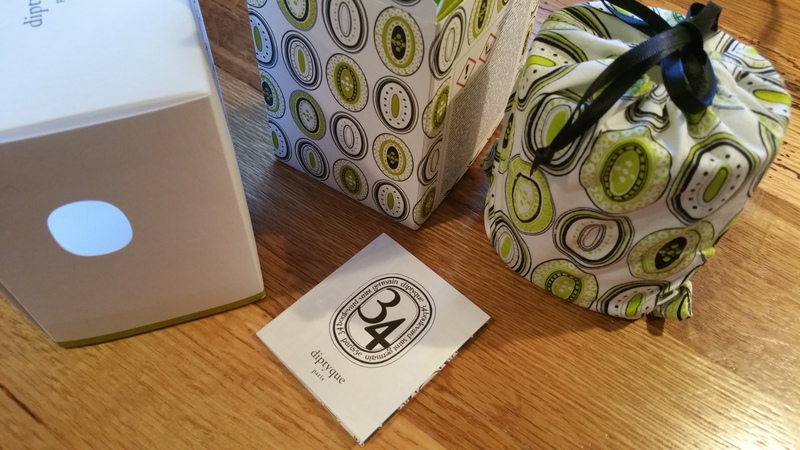 Because Diptyque doesn’t categorize these into “Floral,” “Fruity,” etc., I figured that 34 Blvd Saint Germain, La Prouveresse, and Le Redouté didn’t “count” for purposes of cataloging Diptyque’s candle in my reference chart. I read the descriptions and could not imagine how any of the three would smell, let alone how I would categorize them. La Prouveresse was the first of the trio I bought. Diptyque describes it as “a path lined with fig and cypress trees, aromatic herbs and crunchy leaves.” I thought I wasn’t going to like this candle because of the reference to fig trees. As you know, I am not a fan of Figuier (Fig Tree), and really didn’t want another round with it. But happily I don’t smell that Figuier-type scent at all when burning La Prouveresse. In fact, surprise, surprise: when I un-boxed La Prouveresse I totally fell for it. Like Chêne (Oak Tree), La Prouveresse has similar notes to Feu de Bois (Firewood). I detect just the slightest of some spicy notes, but the woody ones carry the show. This is a simply beautiful candle, both in looks and in smell. The jar is fashioned from green and bisque colored clay, and stamped with Diptyque on the front. Strangely, though, it seemed as though La Prouveresse burned a whole lot faster than the standard candles. I lit it and didn’t have to wait long for the top to be liquefied. I haven’t burned it more than three times, although I wanted to— I am trying to ration my use because of the high price tag ($85). I did initially get distracted by those cloves, but I was pleased when the other scents came out and Le Redouté missed going the direction of Pomander or Oranger. The unexpected floral notes make this a complexly scented candle. I would categorize this as “Floral” overall. 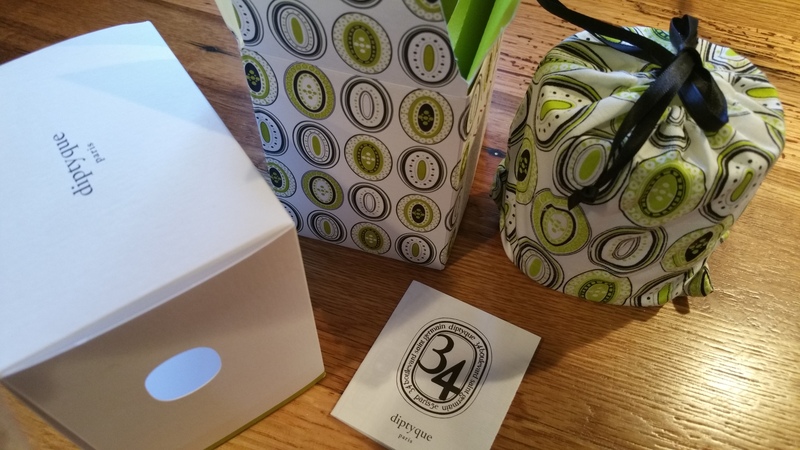 By the time I got to 34 Boulevard Saint Germain (“34”), a 50th anniversary commemorative candle and the first of the three candles released, my expectations were through the roof. But even when un-lit, 34 assaulted me with it’s similarity to Figuier. I almost ran off. But I gave it a chance. 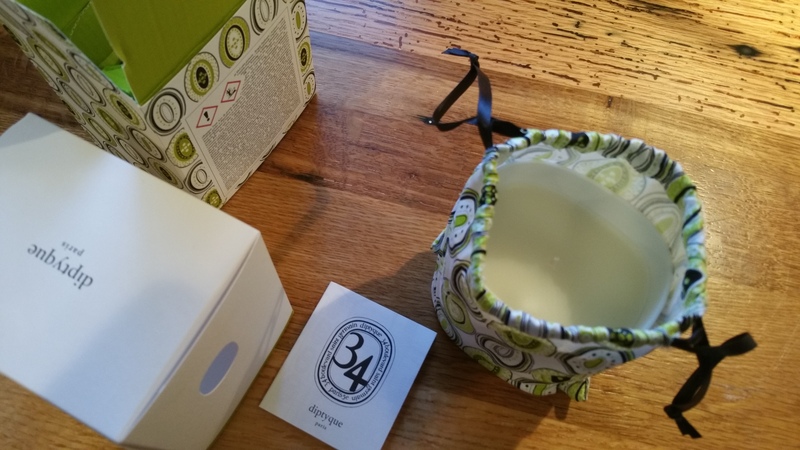 As you have guessed, 34 is my least favorite of the three jarred Collection 34 candles. And that is an understatement. La Prouveresse is my favorite, and I am confident I will burn it down and want more. I probably won’t take out Le Redouté to burn all that often, but I do enjoy it. I will certainly be saving the jars if and when I do burn one down! Have you tried any of these three candles? I would love to know what you think. Reminder: I LOVE to get comments, questions, tirades, or whatever else you’ve got! Le Redoute was my surprise find earlier this winter. It was never on my radar until it came as part of a gwp and I loved every minute of the 35g burn. I forced myself to finish the three holiday candles before ordering a full sized Le Redoute. It arrived last week along with the new, highly anticipated Rose Delight. Rose Delight is sitting opened on my desk, but it’s Le Redoute that’s getting my burn attention! La Prouveresse should arrive this week and I hope I enjoy it as much as you do!